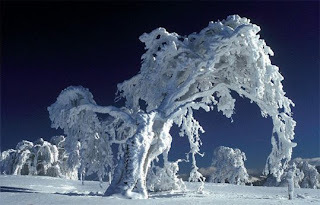 Looking for a New Year's haiku/tanka to feature tomorrow, New Year's day. Deadline 9:00 AM, Eastern Daylight Savings time. Best haiku/tanka received will get the winner a free 6 issue subscription to Lilliput Review. Or a 6 issue extension or 2 chapbooks for those currently subscribing. Previously published haiku/tanka considered. Mail entries to: lilliput review AT gmail dot com. 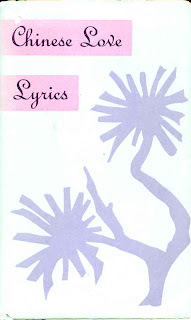 Continuing the exploration of my poetry shelves, the next book I come to is Chinese Love Lyrics, one of those slim verse volumes produced by Peter Pauper Press back in the day. Books from this press were inexpensive ("prices even a pauper could afford") yet at once decorative and, most importantly, often full of classic and unique translations of Asian literature, frequently from Japan and Asia. Our separation is less cruel. In Chinese poetry, as well as Japanese that was so heavily influenced by it, the moon was a ubiquitous presence, often shining down on lovers separated by great distances, as in this poem. That ubiquitousness is an important spiritual element, grounding humans in the very transitoriness of life and directly connecting us to nature. That it is used in love poetry as a lyrical, romantic facet adds a depth that is is at once essential and resonant. In fact, this connectedness can be further illustrated by two more of my favorite poems from this particular collection, one using bird song and the other a river as the moon is used in Chiang Che-Kin's poem. On a piece of silk. When will the River go dry? My love for you will not be in vain. Li Po's poem has the young woman hearing bird song and, with it, her thoughts take flight to her distant lover. Embroidering a little verse, perhaps this very one into her lover's robe is a nice touch by the poet (and his persona), giving one pause over our parochial use of the term post-modern in recent times, as if "modern" culture was the first and only culture to reflect upon itself and its own creations with artistic distance, be it ironic or no. As the moon's light and the bird in flight connect the lovers in the two previous poems, so the river connects a separated pair. I love the fact that they take life from the same source, as life has always centered around the sources of water. The juxtaposition of the questions of when the River will dry and when will the lover's sorrow end is particularly poignant, equating as it does death with the end of love. Simple a lyric as it is, it returns us to the source of all things, a touching reminder of our implicit involvement with nature which today we push so far from whom we are and what we do. Finally, one last poem from this lovely collection that may remind you of something a bit more modern than classic Chinese poetry, if a tad short of a ramble in the field of post-modernism. Daylight! And I must leave. Beloved friend, do not rise! Of the night watchman sounding. Thy arms, which are my recompense. Look! The leaves are covered with pearls. Of dew....A blackbird is whistling. Hunting thee hence with hunt's-up to the day. This delightful little volume can be found on Amazon, which I don't link to, and there are some slightly more reasonable (and descriptively more reliable) copies at abebooks. Chances are that if you head off to a local used bookstore, if you are lucky enough to have one, and are patient and persistent, a reasonably priced copy will come your way. And you'll have gone outside! There's a bunch of nature out there, for sure, and more than a few potential poems, both literal and figurative, awaiting your particular attention. A couple of quick items: the November/December Small Press Review has selected issue #170 as a featured "Mag Pick" for that issue - as always, back issues are available for a measly $1 or, if it's a tight month, send a self-addressed, stamped envelope and I'll send a copy so you can see what they are on about. For those with a subscription to SPR, you can see their Nov/Dec issue here in pdf form. In addition, Longhouse Publishers and Booksellers has selected Ed Markowski's broadside "15 Poems" as one of their "Prime Picks" of the last few months. You may see their fine list of choices at their blog, A Longhouse Birdhouse. Finally, Norbert Blei has highlighted the Ed Markowski broadside on his excellent blog, Bashō's Road: for a taste of the broadside, click here. The broadside is issue #172 (which is still in the process of shipping to subscribers) - if you'd like a copy, the terms are the same as in the previous paragraph. For those not tuned in last week, the new feature I'll be highlighting in these weekly posts will be the Lilliput broadside issues, which have been published throughout the full 20 year run. Broadsides feature the work of one particular poet; the idea is to let the poet stretch out a bit, so there is no ten-line restriction as in regular issues. They are available for $1 or 3 for $2: here's a full list of those published to date. This week's poem is from Mark Hartenbach's excellent broadside, "Butterfly, Corkboard," which was issue #158, published in August 2007. Hope you like it. Here's a little something I never expected to happen on Issa's Sunday Service: a LitRock instrumental. Not only is it appropriate but, considering the circumstances, it's perfect. This week saw the birthday of guitar impresario, Adrian Belew, whose studio and solo work, and contributions to the groups The Bears and King Crimson, are the stuff of legend. Particularly his instrumental contributions are legendary, though his lyrics are pretty amazing, too. So, how is an instrumental, in this case "Sartori in Tangier," LitRock? For those who know a bit of Beat history, Tangier looms large. It is where Bill Burroughs went while avoiding legal complications, following the path of Paul and Jane Bowles. 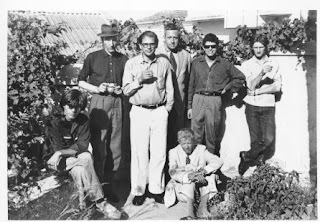 On my wall right now I'm looking at a famous photo of Burroughs, Ginsberg, Peter Orlovsky, Alan Anson, Corso and Bowles posing in Burroughs' garden in Tangier, 1961 (Photo above). In addition, it alludes to Kerouac's novel, Satori in Paris, in its title. Satori, of course, is what all were seeking; in English parlance, enlightenment (NOTE: as pointed out in the comments, the actual title is Sartori, not Satori, but the pun seems intended and, in the end, seems a wash) . This cut comes from the King Crimson album, Beat, which also supplied the sixth song in this series, "Neal and Jack and Me." Also included on the album is a cut entitled "Heartbeat," which may be an allusion to the Beat Heart Beat by Carolyn Cassady, wife of Neal. "Neurotoica," another cut on the album, refers to a Beat magazine of the same name and "Howler" gets its name from the original, Mr. Ginsberg himself. So, if ever there was a Beat rock album, this is it. Ironically, "Sartori in Tangier" actually features the work of the other guitar impresario in the band, the incredible Robert Fripp. On this cut, Belew ably backs up Bill Bruford on a 2nd set of drums. Just watch the following live performance and attempt to keep your jaw from hitting the floor. This week's poem comes from issue #55, April 1994. The issue was previously featured in a post back in January of this year. from which no one has fallen. where no swimmer has drowned. that have never drawn blood. Here is the revolution unbetrayed. Here is the poem that saved a life. PS For a list of all 45 (and a half) songs to date, click here. A poem for those alone, away from home, or with no home at all. Tumult, weeping, many new ghosts. Hope everyone is enjoying the various holidays celebrated around this time of year and all have a friend, a companion, perhaps family to spend time with. Currently, I'm reading two books on classic Chinese love poetry. I hope to be taking a longer look at these in a future post, but, for now, here is a poem of love, from the Peter Pauper Press book, Chinese Love Lyrics, to go with the idea of peace. Enjoy. cypress branches in which to plunge my face. 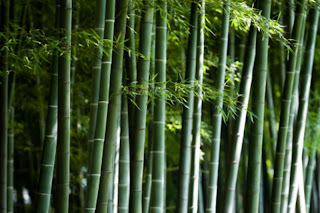 Among the bamboos she loved. Friday, December 18th, was the birthday of Keith Richards and so, running perhaps a little counter to seasonal sentiment, this week's selection is "Sympathy for the Devil" by the Rolling Stones. The list of historical events is obvious, but what's the lit connection, you might ask? Jagger has claimed that the song was influenced by French writing, particularly Baudelaire, but isn't really exactly sure. Folks have pointed out a lot of parallels to Mikhail Bulgakov's classic novel, The Master and Margarita, and though this connection may be tenuous I'll take it, coupled with Jagger's account, and call it a LitRock sizzler. Though originally attacked by fringe groups as promoting Satanism, the songs strong moral underpinnings are rather obvious to anyone who bothers to listen. That the singer takes the persona of The Devil certainly has its model in religious sources, in the West starting with the Bible itself (which, of course, is a 3rd lit reference). As a bonus, here's a live performance by the Stones, arguably at their creative peak from their film, "Rock and Roll Circus." PS If you receive The Hut via email or a reader, you may miss audio and video attached to posts, especially Issa's Sunday Service. For the full post, just click through. A while back, I did a post on Georg Trakl, mentioning the translations by James Wright and Robert Bly, entitled 20 Poems (available online as a .pdf here). I've finally found the time to read through the translations a couple of times and my enthusiasm for his work is unabated. The appeal to Wright and Bly is apparent; these two poets, known for their "involvement" in the deep image movement, find essential source material in Trakl's work. The poems revolve around the images, many of which appear as motifs, even in such a small selection of Trakl's work. The abiding feeling I get is one of evocation; the poems do not posit answer or philosophy or even present an open-ended question. It seems to me that they are really the stuff of archetype, a kind of dream-like essence that dwells firmly in the border between the conscious and unconscious. A dream-poetry, a Jungian poetry, probing into the uninterpretable human spirit. The golden clouds over the fishpond. The best of Trakl's work is firmly grounded in nature; one thinks of Wright's The Branch Will Not Break, the most naturalistic of his works. In actual execution, the work itself feels closer to Bly than Wright; better than Bly, hitting a universal chord Bly frequently speaks of but doesn't quite achieve lyrically. This is, of course, strictly a matter of taste. Trakl's work is haunting and it lingers with me long after I've put it down and, siren-like, summons my return as to an elusive, spirit-infused wood. What is hinted at in many poems is most explicitly sketched in the following, which conjures a sort of contiguous sense of all time. There is an historical tapestry here, yet that seems to be something of a background against which a larger story is unfolding, one that mixes equally the sadness and sweetness of existence itself. Oh the soft cornflowers of the night. And around us the hill and forest shone strangely. When we behold a stony face in the black waters. And the sweet song of those risen from the dead. The overall mood is of dread, foreboding. All of history comes to Trakl's point in time; World War I and its coming horrors, of which he was a victim, are pre-figured here through the lens of history, yet Trakl is not after the political. The most salient point, his true focus, is humanness, human existence. There is a sense of loss: the loss of nature and a related innocence. Two of Trakl's poems I highlighted in an earlier post capture nature before this loss. 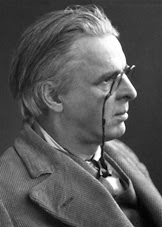 Not many of his predominately naturalistic poems are contained in the selection by Wright and Bly, though naturalistic elements permeate the work throughout. Silence in the rented room. The motionless sea grows dark. Followed me softly in my sleep. The sense of foreboding in Trakl is the main focus of the 20 poems translated in this little collection. In "Birth," there seems to be a balance achieved between the prophetic and the pastoral; ironically that balance seems to be man himself. These mountains: blackness, silence, and snow. Oh the mossy gaze of the wild thing. When the cold moon seems ready to fall. Something pale wakes up in a suffocating room. Of the stony old woman shine, two moons. Perhaps the two threads of nature lost and coming dread are inextricably woven together. As with Wright's work, I want to read hopefulness in the natural world, even with its built-in dread, and not the loss of nature due to man's perception of being outside of or over nature. 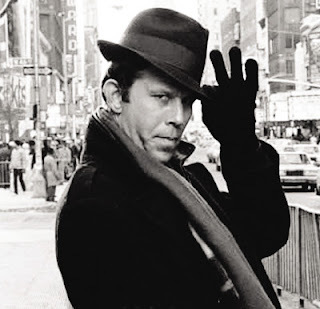 As with Wright, however, one doesn't get one's wish. What one does get is a unique, poetic panorama, a haunting vision that's is at once powerful, delicate and a thing of beauty: the poetry of Georg Trakl. 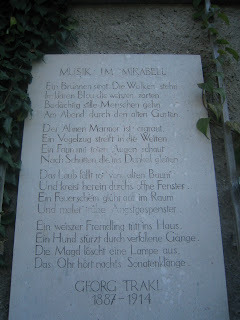 Pictured above is Trakl's grave marker, with his poem "Music in the Mirabell" inscribed in stone. As may become apparent in the poem, Mirabell is a garden. Here is an English translation of what is described as the "second version" by Alexander Stillmarker, in a volume I just purchased, Poems and Prose, published by Northwestern University. At evening through the ancient garden. Ancestral marble has grown grey. A flight of birds seeks far horizons. At shadows gliding into darkness. And circle in through open windows. And conjures up wan ghosts of fear. A white stranger steps into the house. A dog runs wild through ruined passages. At night are heard sonata sounds. I've been deliberating on what to feature from the Lilliput archives since, over the years, I've featured poems from the full run of regular issues in this blog,. 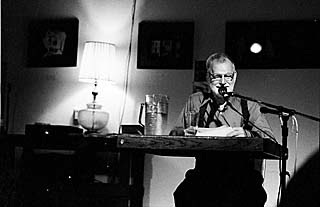 Should I highlight "Brobdingnag" feature poems (poems over the usual 10 line limit), of which there have been 57 to date? Or perhaps poems from the 45 broadside issues, featuring the work of individual poets? Or perhaps poems from the 20 "Modest Proposal Chapbooks" that have seen the light of day? An interesting dilemma. nesting in the mane of a lion’s head. For another poem from the 15 poem sequence, "Paganini," check out this post from when the broadside originally appeared in March 2008. For more info on Lillie broadsides, check here. PS. For those of you receiving posts via email, you may not see icon for Grooveshark song (or YouTube videos in other posts). Just sayin' ... you might want to click through. Some news on the home front: Lilliput Review is one of 13 blogs featured in the Suite 101 article Best Poetry Blogs: A Baker's Dozen by Joseph Hutchison. I am quite humbled to be in such fine company and tip my hat to Mr. Hutchison for his recommendation. Suite 101 is a resource I've used countless times while researching poetry, both for this blog and for work at my daytime job, so it's a real honor. Scott adds the refrain from Yeats's poem at the opening and so its serves as the chorus for the song. Very nicely done, indeed. This is the first appearance for both The Waterboys and Yeats on the LitRock list, but I have a feeling it won't be the last. The Waterboys have put together and will be performing an all-Yeats show in March 2010 at the Abbey Theatre in Dublin. The 5 shows have almost completely sold out. No doubt this will be something of an historical event; one can only hope that a recording will be made, either live or in the studio afterward. 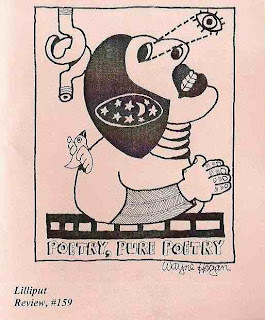 This week's featured poem comes from Lilliput Review #52, from December 1993. Here's a number from Pittsburgh's finest purveyor of the short poem, Bart Solarczyk. Enjoy. Most things come & go. None of us is saved. 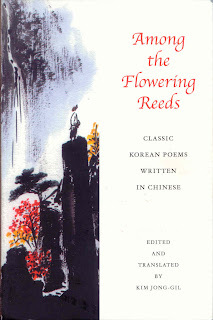 With Among the Flowering Reeds: Classic Korean Poems Written in Chinese, Kim Jong-Gil has performed an astounding acrobatic-like feat of translation, bringing to modern English speaking audiences a genre of poetry as lyrical, philosophical, and important as any in world poetry. These translations are exquisite in the sense that they are at once precise, evocative, poetic, and faithful to English, the language into which they are translated. Part of White Pine Press's "Korean Voices" series, which in turn is part an overall catalogue of some of the most outstanding poetry titles offered anywhere, Among the Flowering Reeds is a must read for those who love Asian poetry in its many glorious manifestations. Why Korean poems written in Chinese, you may ask? The reason is that Korean as a written language (hangul) is relatively recent, dating back to the 15th century. Previous to that, classical Chinese, wen yen, was used in Korean literature, as it was for most East Asian literatures. Since there were significant differences in the two languages, the development of hangul became necessary. However, hangul as the written language took some time to catch on and writers and poets continued to use Chinese characters well into the 20th century. As a result, much of Korean literature was originally written in Chinese. 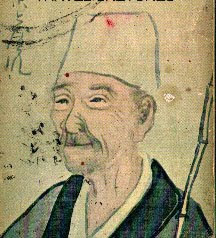 Jong-Gil's selection of 100 poems in Among the Flowering Reeds covers more than 1000 years, from the late 9th century into the early 20th. Jong-Gil notes in his introduction that, because of the nature of classical Chinese, he has had to take liberties with the literal sense of the words in order to capture the poetic and rhythmic quality of the original. How this has all been translated into not just competent, but lyrical, near flawless English is an accomplishment to be held in deep admiration. and drowns out the human voices close by. I have arranged the waters to cage in these mountains. wind sweeps light rain over a returning boat. each leaf rustles coldly, awakening sorrow. I have had little luck with my ill-fated career. What have I achieved these years away from home? I have returned empty-handed from so far away. the wildflowers, wordless, smile to make me stay. together with poverty, it it the root of all my grief. that is the sky's way, as well as man's. your escape from fame will bring you a name. clouds will come and go, but mountains do not argue. you won't find happiness where you crave joy. I long for home, but home is still far away. no one owns the wild peach, but it bursts into bloom. I have found no autumn joy by the eastern hedge. into my greying hair, not yellow chrysanthemums. These translations are so smooth, so seemingly effortless, they seem to not be translations at all. Get it at the library, get it at your favorite independent bookshop, or, best of all, get it directly from White Pine. Support the small press. This week's featured issue of Lilliput Review is #170 from July of this year. With this issue, I will have featured highlights from regular issues over the last 20 years on this blog. It's really hard to imagine that there have been over 360 posts here since Issa's Untidy Hut started back in November of 2007. 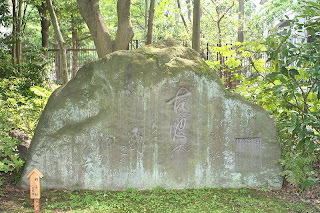 Many poems were also featured at the previous short-lived blog, Beneath Cherry Blossoms, before it. I'm still weighing how to proceed. Meanwhile, here's some highlights from #170. Enjoy. Back a number of months ago, I was contacted by Paul and Scott of Roadrunner ("best short poetry magazine ever") to judge the 18th installment of their haiku selections, The Scorpion Prize. I was simultaneously flattered, honored, and a bit intimidated. I was often confused, frequently bemused. ---So, what manner of judge is this, one might rightly ask? The quality of the work was excellent; deciding which were the top three poems was truly a test of humility, liberally shot through with hubris. A little like that coffee-infused vodka going about these days. A contradiction in terms, like judging poetry, or being an editor for that matter. To see how I worked it all out, check out the full essay with top three haiku (pdf document). If you are a poet or connoisseur of the short poem, Roadrunner is a must. My thanks to both Scott and Paul for their faith in me - I greatly appreciate it. Some misc notes of interest: of the 6 prizewinning haiku in the 2nd Annual Bashô Haiku Challenge, only one was from the United States (Peter Newton). The others were from Japan (William Appel), Poland (Jacek Margolak), Romania (Eduard Tara), Canada (Terry Ann Carter), and Croatia (Dubravko Korbus). The only one I've been unable to contact about winning: Peter Newton from the US. So, if anyone knows Peter's email (I have an email address - it didn't bounce, but no reply) or knows him, if you would give him a shout out from me, I'd appreciate it. Also, there has been some Albert Huffstickler related news. There is an interesting spiritual-themed post at Thousand Voices that features a great poem by Huff, entitled "The Cure." Also outlaw poetry and free jazz has posted a notice about emailing Austin City Council to get a local park named after Huff. I posted here about this back in August, but evidently its getting down to the wire so now is the time to be heard. If you have enjoyed Huff's work as much as I have, drop them a line. There is even a sample of what you might say in the outlaw poetry post. Here's one of the many poems Huff published in Lilliput over the years. I've posted this one before but there are no good poems that don't bear a second reading. After weeks of working through nearly 500 haiku from 99 poets, I've made a final selection of 56 poems to be published in the 2010 2nd Annual Bashô Haiku Challenge chapbook. Though I received 3 times as many entries as last year, the task seemed a thousand times more daunting. I set no particular limit or had no particular length in mind for the chapbook, so the final selection represents only the highest quality of work I received. Last year's chapbook contained 25 haiku, making this year's over double the size. I would have been happy to publish another chap of the same size, but the quality of entries demanded a weightier book and I am even happier to oblige with that. I will let William's poem speak for itself, only saying that to evoke the entire macrocosm via one of its smallest components, in just 5 words, is a daunting accomplishment and the stuff of great haiku, indeed. Choosing these 6 poems among the 56 selected overall proved to be quite a challenge, so the title, Bashô Haiku Challenge, swings both ways, for the editor as well as the poets. I'd like to thank everyone who participated this year and say sincerely that, though the task was massive, it was well worth the effort. The work brought great joy, sadness, and the myriad gamut of emotions that move between. Part 2 of the "daunting task" begins with the shipping out of the 6 prizes and 6 issue subscriptions to all 50 plus poets whose work will be included in the forthcoming chapbook. I anticipate publication of the 2nd Annual chap to be sometime mid-year 2010. I sincerely hope to get all of the new subscriptions out in the mail over the next 4 weeks. Since this happens to dovetail with the new issues going out to current subscribers, I'm not quite sure how I'm going to pull it all off. Bear with me, folks - all good things are worth the wait, as the cliché goes. One last note for the moment about the contest; I'd like to particularly thank the online haiku community for embracing and promoting the challenge. The amount of international submissions I received (and accepted for the chapbook) was truly amazing. Thanks particularly to haiku societies in Australia, Canada, Croatia, and Great Britain and, I'm sure, others I wasn't even aware of that sent out notices about the challenge. Thanks, too, of course to all who submitted and the stateside folks, such as Jim Kacian at red moon press, that really gave the whole idea a nice lift. I'm sure I've forgotten someone but you get the idea: I am grateful, indeed. The new issues, #'s 171 and 172, begin going out this week, contributors having just received their copies. With an additional 50+ copies to be printed, collated, folded, and stapled (see above), it will be awhile before they all get in the mail. I'm hoping to post the majority of them over the next 4 weeks, but chances are it may take a bit longer. Ah, the price of success of a one-person operation. earth or newly split wood. To make something of a hut.